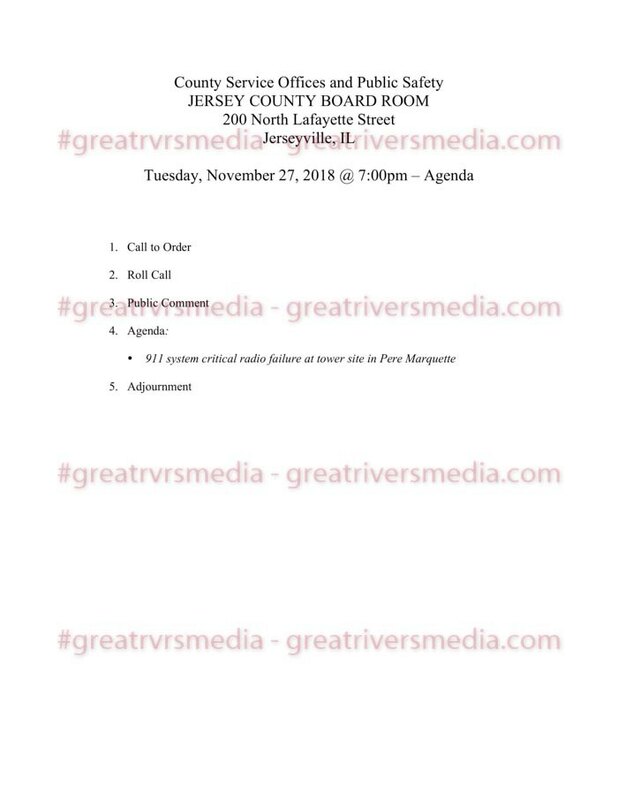 Agenda for 11/27/2018 meeting to discuss failed Jersey County fire and ambulance radio system. JERSEYVILLE - Rob Hedger, Jersey County 911 Director, has reported to the county board chairman that the 911 system has experienced a critical radio failure at a county tower site located within Pere Marquette State Park. The failure affects the frequency used to page and communicate with three of the county’s fire agencies and one ambulance service. A communication issue was reported to Hedger a few months ago. The site installation is supposed to have a 50 watt repeater and a 100 watt amplifier to receive and transmit the frequencies relied on by the affected agencies. When radio technicians went to the site and discovered that the repeater was transmitting less than 30 watts and the amplifier was missing or eliminated from the site altogether. Minor modifications were made at the time of the visit to the existing equipment but with the knowledge that the fixes were temporary. Recently the Medora Fire and Ambulance Service reported that they are no longer getting the pages nor are they able to communicate with the communications center on the fire frequency. According to count board chair Don Little, the fix has failed. Hedger has advised Little that he was going to tie this project into a comprehensive radio network upgrade with the sheriff’s radio frequency that’s been recently discussed, but has concluded the Marquette tower issue probably won't won't wait for a comprehensive fix. The preliminary options, according to Little, range in cost from about $20,000 to replace the repeater and prep the site to migrate to a two-tower simulcast network the current Sheriff’s office is now using, to a second option costing approximately $50,000. The second option would include replacing the broken components and migrate to a two-tower simulcast network. According to a document sent to County Services and Public Safety Committee members, Little states that the second option would provide a better fix to this problem and ensure adequate radio coverage for the public safety agencies using the county-wide fire frequency with broadcasting occurring on both the Jerseyville tower and the Pere Marquette tower. Hedger is expected to provide information this evening's 7 p.m. meeting so the committee can evaluate and provide a recommendation to the County Board during the meeting scheduled for the morning of December 3 at 9:00 a.m. prior to the installation of the new County Board.